I am in Ft. Lauderdale right now. Leon is safely back in Chicago. We drove from Key West to Miami yesterday. There was a bit of extra time, so we decided to visit a spot we have never explored before: Fossil Reef State Park at Windley Key. A lot of the land that makes up the Keys consists of fossilized coral reefs. The fossil reefs at the park are especially visible because this area was used as a quarry by Mr. Flagler in the early 1900s when he was creating the Overseas Railroad that ran the length of the island chain. We chose the Hammock Trail to explore. The guide at the visitor center was very pleasant and hlpful, offering us a trail guide to take with us. It contained a lot of tree identification. I was hoping to learn to identify more of the hammock trees. I've heard many of their names- Pigeon Plum, Jamaican Dogwood, White Stopper- and feel hopeless about identifying most of them. 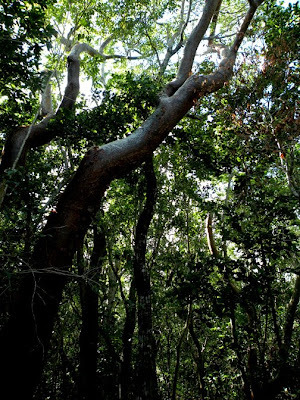 Gumbo Limbo is easy because of its peeling reddish bark. I have also learned to identify Poisonwood. This is paretly out of necessity, as it's a relative of poison ivy and has similar consequences, and partly because it's a distinctive species. I was pleased to learn to identify a shrub called wild coffee (Psycotria nervosa), and the mastic tree (Sideroxylon foetidissimum). I'll confess that I'm still sufficiently confused by the tree species in the hardwood hammock ecosystem that I don't yet feel att home there, even though it's an ecosystem that I really love visiting. There were some opportunities for insect photography, but not much time. We saw some striking bagworm cocoons and lots of Eastern Pondwawk dragonflies. There were a whole bunch of Whitecrossed Seed bugs wandering (and mating) on the sterile sand inside of one of the areas that had been quarried. My overall impression of the area? In general, I've been very impressed with Florida's state park system. The park was clean, the trails were well marked, and the interpretation was of high quality. The park contains important remnants of a fragmented ecosstem, and is well-managed in terms of things like invasive species control. Definitely worth a visit. I know I'll be back. Welcome Nature Blog Network readers. Thanks to Wren for kindly presenting Gossamer Tapestry os this week's featured blog. I appreciate seeing your photos of a place that I know I will never visit. I especially like your analysis of Florida's park system itself. There is definitely something to be said for knowing what to look for and how to gauge the health of an ecosystem. I was just reading about that park in the park guide last week. I think you are correct, Florida has a stellar park system. I esp liked the photo of the seedbug. Sorry to say that Windley Key is one of the parks that the state is considering shutting down due to budget cuts. 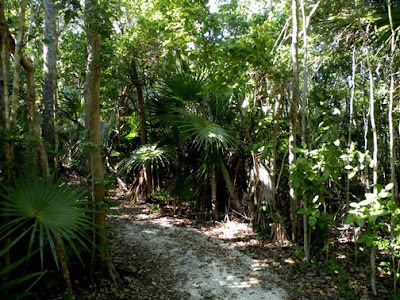 Like Kissimmee Prairie State park,a favorite of mine, the word was that they would put these and a number of other parks in conservator mode and close them and have only skeleton crews. Did anyone at Windley Key mention anything about it? Another great post Doug. In all the trips I have done to the USA, I never got down to Florida for some reason so it is great seeing these picures. I love the dragonfly but would definitely also want to stay away from the poisonwood. YOU are having too much fun.....get BACK where it's 10 degrees and complain like we are doing. Robin- Thanks. This is another one of those ecosystems that it's hard to capture the essence of in photos. The vegetation is just too dense. FC- On the Florida State Park system, the thing that impresses me is that a really well-run park like Windley Key is not an exception. I found it pretty representative of the other state parks I've visited. lilliannattel- Thanks. They were abundant and not especially difficult to photograph. Much easier than a lot of my photographic quarry. myamuhnative- Welcome to the Tapestry. I like your handle. We are having a similar problem with state park closures in Illinois. In our case, much of the blame can be laid at the feet of the corrupt, recently impeached governor. Nobody at Windley Key said anything about the pending park closure, though I did read about it in the local paper. Joan- Florida is well worth a visit, though this is not the best time of the year to see insect life. Mark- I head home this afternoon. Nice to hear that some states know how to keep up their parks. I found a bagworm last summer and spent the day with it--watching it drag itself around and munch its way through the day. Robert- I was out in your part of Florida for part of this trip. It's also beautiful. Dave- Yeah, I wouldn't put Illinois on that list. The problems is not the people who work at the parks here- they're great. They have no support for their work. Nina- your photos are way cooler than mine. Bagworms are much more interesting before they pupate.